St. John USVI, St. John travel, St John vacation. - VisitStJohn.com In the US Virgin Islands. St. John is America's Paradise in the Caribbean. 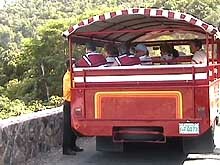 Transportation around St. John is a snap. Full range of convenient car and jeep rental services and local transportation is available. Getting around St. John can be easy if you are interested in doing a little walking. Local transportation in the form of open air taxis operate all along the North Shore Road and go past or into Canneel, Trunk, Cinnamon, and Mayho beaches. 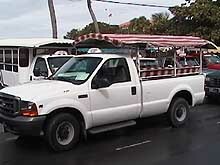 Plus, bus service runs hourly all the way to Salt Pond. Open air taxis are readily available for tours and to transport you to beaches and attractions. There are no taxi meters. The VI Taxicab Division sets fares and they are widely posted. Rates are per person (half price for children under six years) based on destination, however, you should still confirm the price with your driver before getting into the vehicle. Many taxis carry eight to 12 people. If you prefer a private taxi you must negotiate a price with the driver. Each additional piece of luggage after the first piece costs US$1. An additional surcharge of US$1-$3 per person applies between midnight and 6am depending on the destination. There is a 25¢-50¢ per minute waiting charge with the first five to 15 minutes free (depending on which island you are on). Hourly and weekly rates can also be negotiated. Sightseeing rates vary depending on which island you are on. If you prefer the convenience, flexibility, and freedom of a car, one day and longer rentals are available. If you decide to utilize a car, please remember that the only gasoline stations are in Cruz Bay. So be sure to keep the tank filled. Public parking in Cruz Bay is tight.When touring the small, 19 square mile, St. John, we recommend not trying to do too much in one day. St. John's smallness is somewhat deceptive. There are a lot of "nooks and crannies" to explore. 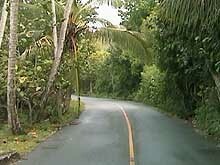 If you are looking for great views, the best ones are found along the Center Line Road and toward Annaberg Plantation. Allow yourself at least two full days to enjoy the island's entire beauty. Please remember to drive on the left side of the road and beware that pedestrians and livestock all have the right of way. There is a seatbelt law. Non-US citizens do not require an international drivers license. Site powered by VisittheVi.com contact the Webmaster. VisitStjohn.com is a member of the The St. John Chamber of Commerce and the Virgin Islands Hotel & Tourism Association. VisitTheVI.com, VisitTheUSVI.com, VisitStCroix.com, VisitStThomas.com and VisitStJohn.com are trademarks and service marks of Tom Yaegel Associates Inc.